Although we live in a culture of abundance and can have almost every food we want, we may suffer nutritional deficiencies such as selenium deficiency which can be harmful to our health. Selenium deficiency is more common than people realize and it is estimated that the number of selenium deficient people in the world is in the range of 500 million to 1 billion. Hence it’s important for you to know the symptoms of selenium deficiency and how to avoid this deficiency. Even if you eat a selenium rich food, you may not be getting as much selenium as you think. The chemical forms and levels of selenium found in plant-based foods depend on the composition and amount of selenium in the soil where these plants grow2. Regions that are especially susceptible to selenium deficiency are North Korea, China and eastern Siberia, however selenium deficiencies have also become a concern for some European countries that have notably low or diminishing selenium levels1. According to the above journal, selenium intake data for a number of countries show that the recommended daily intakes are not achieved in the majority of European countries and it is estimated the number of selenium deficient people in the world to be in the range of 500 million to 1 billion. Many foods are rich in selenium, such as many types of seafood and meats—but for a great, healthy vegetarian option that packs a selenium punch, Brazil nuts are the way to go. Here are some of the health benefits of selenium. Selenium is needed for the immune system to work properly. Deficiency may cause mood imbalances1, and can contribute to a higher risk of developing diseases like cancer, and rheumatoid arthritis3. According to a study published in the journal Biomedical and Environmental Sciences, oral supplementation of selenium may reduce your risk of cancer5. Selenium is needed to form selenoproteins, which are necessary for producing glutathione peroxidase whose main job is to protect the body from oxidative damage. The antioxidants and protective properties found in selenium help fight off free radicals, which can cause cell membrane and DNA damage. Free radicals can also cause premature aging and skin damage. Although selenium can be found in some meats and seafood, plant based foods are the major dietary source of selenium. The content of the soil that these foods are grown in plays a large role in the amount of selenium they will have. Selenium deficiency is most commonly reported in China and Russia where the soil contents are low. People in these areas are at a greater risk of becoming selenium deficient. People who have had part of their intestines removed or who suffer from a severe digestive disorder may also be at risk for selenium deficiency2. 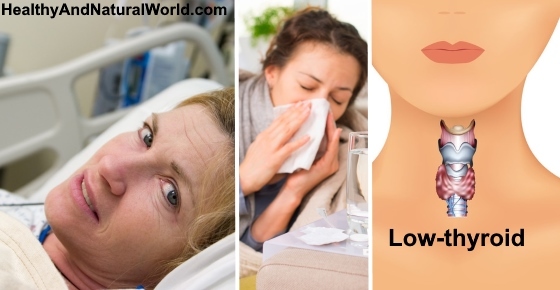 Weakened Immune System – Because selenium plays an important role in immunity, you may start feeling weak if you have a selenium deficiency. If you find yourself getting sick a lot recently, try increasing your intake of selenium rich foods and see how you feel. Fingernail Discoloration and Hair Loss – Selenium deficiency has been associated with a loss of hair that can include your head, under arm and body. Your skin may become discolored and you nails may develop a heavy whitening appearance (also see my article about the 11 health warnings your fingernails may be sending). Fatigue – If you feel tired all the time or more than usual, you may be fighting a selenium deficiency. This may occur as a result of a weakened immune system, which makes you a target for lots of health related problems. Brain Fog – If you have trouble concentrating, memory loss or even bouts of depression, you may be deficient in selenium, which has been associated with mental fatigue, anxiety and some types of depression. Hypothyroidism – Hypothyroidism occurs when your thyroid does not produce enough hormones. If you experience fatigue, depression and weight gain fairly quickly, you may want to have your selenium levels evaluated (also read my article about the top 13 signs that you may have a thyroid disorder). Infertility – According to a study published in the Journal of Obstetrics and Gynecology, selenium deficiency may cause reoccurring miscarriages4. In men, being selenium deficient may bring on mortality of sperm. Other symptoms associated with selenium deficiency include muscle weakness, heart problems, muscle wasting and reoccurring illnesses such as the flu. Chronic selenium deficiency has been linked to mental retardation, heart disease, cancer, asthma, and rheumatoid arthritis3. Selenium deficiency is a major factor in Keshan disease, a fatal form of the malfunctioning of the heart muscle. Improving selenium nutrition status in children has been linked to the reduction of Kashin-Beck disease, a disease that is characterized by the degeneration of cartilage between joints3. When foods are refined or processed, selenium levels are destroyed. The best way to get your selenium is by eating a variety of whole, unprocessed foods3. Brazil nuts are a great unprocessed food source of selenium. You can read more about their health benefits in my article about the health benefits of Brazil nuts and how much to consume. When taken at high levels, selenium can be toxic. It can also interact with some medications. So if you plan to take selenium supplement, be sure to notify your doctor first. According to a study published in the February 2008 edition of the American Journal of Clinical Nutrition, consumption of 2 Brazil nuts daily is an effective way for increasing selenium levels. However, according to this study over consumption can actually have a detrimental effect on health. Some evidence shows that taking over 200 mcg of a selenium supplement per day can benefit some conditions. But there is a chance that taking this dosage over a long period of time may increase your risk of developing diabetes3.